Love is in the air. February 14th is coming up soon and we are here to help play cupid. We found spots around town to fit your style, whether you want to woo a date, hang with friends, treat your sweetheart, or fly solo this Valentine’s Day. Find just the right ambiance for a memorable evening out. We’ve done the legwork. All you need to do is reserve. Dine in a room surrounded by on of the largest private art collections in the world at Atlas. Entrees are as artfully plated as the walls of Picasso, Chagall, and Monet. Chef Christopher Grossman is preparing a 4-course prix fixe ($150) of his seasonal cuisine with European influence, along with pastry chef Christian Castillo’s dessert. Classic or Legendary wine pairings are available for an upgrade. The restaurant’s regular menu will also be available if you just need to have the black truffle and mushroom Agnolotti; we understand. Ask your server for a tour of The Lewis Collection of 20th century artwork. Tip: Atlas is connected to the St. Regis Hotel. Atlas. 88 West Paces Ferry Rd. NW, Atlanta. 404-600-6471, atlasrestaurant.com. If you are more enamored by hops and malt aromas, take love to the brewpub. Chef Terry Koval of Wrecking Bar has a special menu planned for the evening: Gulf shrimp bisque with sherry, tarragon oil, and croutons, fried Gulf oysters with kumquat, capers, preserved yuzu, and caviar dressing, dry aged beef with whipped CalyRoad Bit O’ Blue cheese. To up the romance, add white cheddar fondue with apple, radish slices, and Bavarian pretzels. Tip: Try a flight of WB’s brews, including Little Tart Sour Cherry Ale. It’s like fresh cherry pie in a glass. Wrecking Bar Brewpub. 292 Moreland Ave. NE, Atlanta. 404-221-2600, wreckingbarbrewpub.com. Chef Nick Leahy’s new Provençal restaurant AIX is ripe for wooing on the 14th. The dreamy interior and menu make for an instant transport to the southeast of France. His four course menu ($75) kicks off with an amuse bouche lobster veloute with tarragon cream, with a broad selection of following courses like seared foie gras, grilled petit lamb chops, spiny lobster, pan roasted scallops, and strip steak. Pastry chef Kendall Baez’s cap off the evening with chocolate bon bons, crème brulee, chocolate ganache tart, and a dish of strawberry, foie, and white chocolate. Upgrade with otional wine pairings. Tip: come early and start with a glass of bubbles or a French malbec in front of adjoining Tin Tin’s fireplace. You don’t have to take a vow of silence, but Brick Store Pub is turning Trappist in the upstairs Belgian Bar for Valentine’s Day. It’s already a dark and cozy nook seemingly carved out of tree, but the crew is upping ambiance with candlelight throughout. Beginning at 5:50 pm, the menu includes monastic cheeses, Trappist beers, and chocolate. Items are available a la carte. Monastic habits are not required, but if that is your romantic jam, go for it. Tip: salted hot pretzels go well with Chimay. Brick Store Pub. 125 E. Court Square, Decatur. 404-687-0990, brickstorepub.com. The warm atmosphere within modern industrial chic of Fudo is still brand spanking new. Chamblee’s novel Japanese restaurant serving sushi and shareable plates even has a dog friendly patio, if you want to include your furry friend. On the 14th they have a 3-course prix fixe spread customized by choosing two small plates (perhaps dumplings? ), three rolls, and dessert. Tip: sake enthusiasts will love Fudo’s large liquid love menu. Fudo. 5070 Peachtree Blvd., Chamblee. 678-691-7088, fudoatl.com. Wander to historic downtown Winder. Bistro on Broad’s chef Alex Friedman’s 4-course prix fixe menu is chock full of luxe with oysters, foie gras, and entrée of filet and scallops, and a pot de crème trio. The whole shebang is just $65 per person and $85 with wine pairings. Bonus: he is serving it Thurs., Feb. 14 – Sat. Feb. 16, so you have three days in which to schedule your endearment repast. Bistro Off Broad. 16 E. Candler St., Winder. 678-963-5517, bistrooffbroad.com. If a planned-out or overdone menu is not your thing and you just want to hang in a pretty atmosphere with happy hour specials and creative cocktails, Watchman’s is the place. Serving only sustainable seafood, it pulls at our heartstrings. You can hide in a booth with a date, sit at the bar with a pal, or gather with a group on the patio. 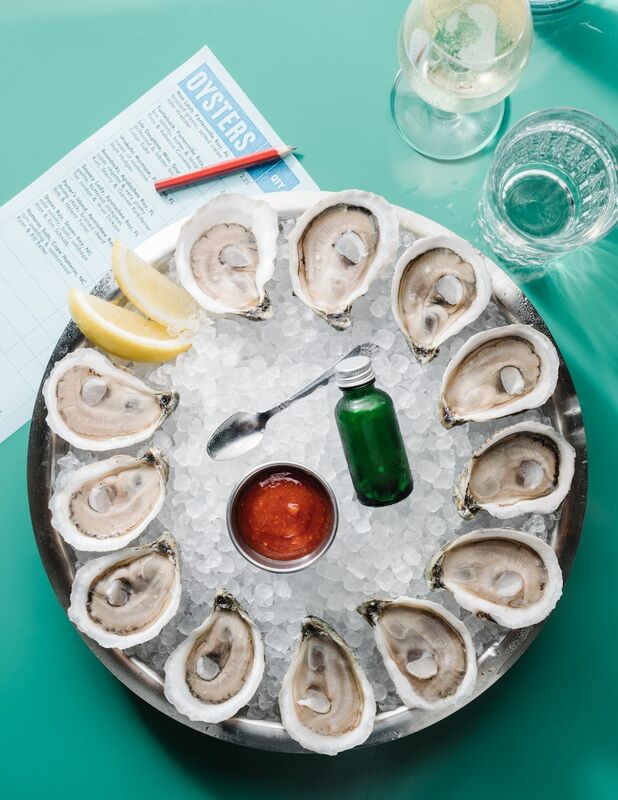 And their specialty is the ultimate aphrodisiac—oysters. The shucking action at the raw bar is an instant conversation starter. Tip: fall for chef Daniel Chance’s lush Sally Lun rolls with butter and sea salt. Flying solo on this holiday? The Barrelhouse neighborhood pub in Old Fourth Ward is planning their celebration just for singles. Their $25 prix fixe for one menu includes choice of an appetizer, entrée, and dessert. House wines are $5 and $3 gets you a red heart colored Jell-O shot. They are mixing special cocktails nemd for the eveing—This Drink is my Date, One is (Not) the Loneliest Number, #Single, Stupid Cupid. Tip: you could also sip from their legit whiskey and whisky list. Barrelhouse. 701 Highland Ave. NE, Atlanta. 404-600-5251, barrelhouseatl.com. Valentine’s Day doesn’t have to be all indulgence, meat, and sweets. Recess’ chef victoria Shore created a vegan tasting menu to celebrate the day. Three courses of delights like roasted and pickled baby carrots and desserts of cherry strudel, vanilla gelato, and vegan chocolate truffles are planned. The menu is available only at the bar. Tip: pair your meal with a zingy turmeric tonic or a turmeric spritz. Recess. 99 Krog St., Atlanta. 404-596-8396, recessatl.com. Sometimes low-key is the best idea for an occasion that tends toward extravagance. Alon’s Bakery and Market is here to help you achieve the best of both worlds. Their “Dinner for Two” to-go ($119.99) is packaged with a 6-course dinner of lobster bisque, grilled tenderloin, and flourless chocolate heart cake. There are step-by-step instructions for flawless execution. Tip: grab a bottle of vino. Educated staff will help to pick the best pairing. Alon’s. 1394 N. Highland Ave., NE, Atlanta. 404-872-6000, alons.com. and 4505 Ashford Dunwoody Rd. NE, Dunwoody. 678-397-1781.